4.3 out of 5 based on 53 bloggers and 5 commenters. 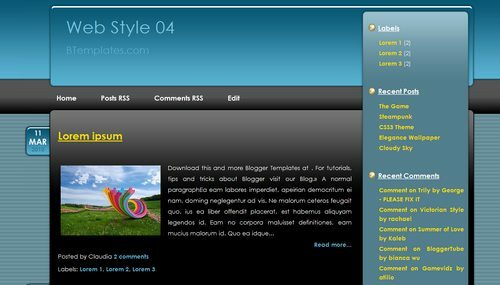 Web Style 04 is a free blogger template with 2 columns, right sidebar, web 2.0 design, rounded corners, posts thumbnails and gradients. Adorei o Template, só gostaria de lhe fazer um pedido, tem como alinhar a coluna da esquerda, para que ela não fique por cima do cabeçalho ? Grato desde já ! Belíssimo Template ! I loved the Template, just like to make a request, is to align the left column, so that it does not get above the header? Thank you in advance! Beautiful template!